It’s easy to dismiss a T-shirt as a basic – something compulsory, a little bit boring. But choose the right shape, style and colour, and this humble silhouette will elevate any outfit you place it in. Black T-shirts, like white ones, are especially handy to have a stack of. They’re the epitome of ‘wardrobe staple’: the perfect foundation layer, an essential part of a flattering monochrome look and one of the easiest ways to advertise your style. It’s a simple piece in essence, one that rides the relentless wave of seasonal trends and always emerges with its reputation intact. Because of its timeless appeal and simple design, we’re often guilty of taking it for granted and not utilising it to its full extent. Here’s how to make this wardrobe 101 item work as hard as any of your investment pieces. Simple and fuss-free – when your T-shirt’s minimalism is its stand-out quality, don’t diverge from it. Embrace it and surround your black tee with like-minded pieces. An all-black outfit is perfect for those who aren’t keen on throwing too much colour into everyday looks and, done right, you won’t look like gloomy weather has consumed you either. Plus, you can literally get ready in the dark. 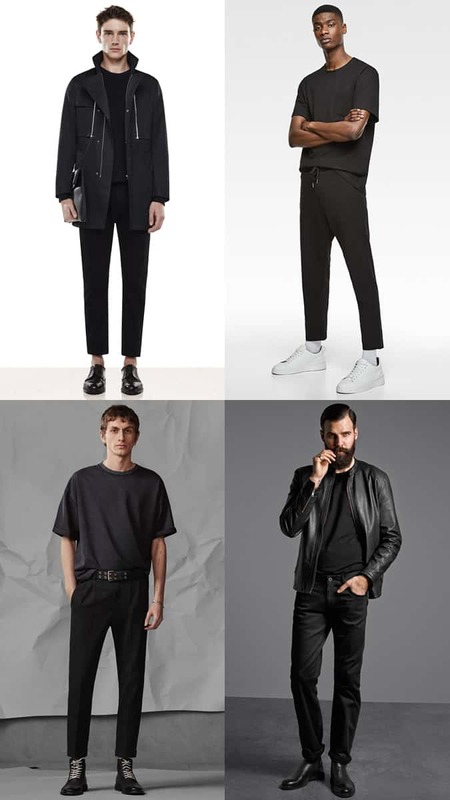 Whether you’re curating a slick pared back outfit or an effortless leather look, the black T-shirt is the foundation allowing everything to flow seamlessly. Opt for a crew neck and keep design elements to a neat chest pocket to maximise versatility. Then it’s hard to go wrong: tucked into smart joggers, loungewear is given a luxe boost. Or above some slim trousers and layered under your jacket of choice, it’s understated yet elegant. If all-black is not sartorially adventurous enough for you, you don’t have to push the boat out too far. Staying within a monochrome colour scheme and pairing your tee with whites and greys can prove equally profitable and easy to style. Again, your tee is the anchor in the outfit here, setting a solid foundation for lighter elements to layer onto. White trousers are a natural choice, offering a brighter bottom half that highlights the neatness of your tucked-in top. Accessorise with washed denim or a monochrome jacket for a neat finish. Alternatively, keep the blackout base and throw on a light-hued blazer when you need to tackle that tricky smart-casual dress code. Normcore is all about not thinking too much and throwing together an outfit that’s relaxed and effortless. A black T-shirt exudes that ethos. As this look is all about easy-going styles, your tee can boast a variety of different shapes and fits, from V-neck to crew neck to the baggier and more oversized. Tucking your tee in is the first rule of normcore, so that’s a given. Despite the second rule often being light-wash denim below the belt, the same vibe is achieved with indigo denim, chinos or even shorts. As long as they’re slightly looser fitting and relaxed, you can make it work. Finish the look with some fresh, chunky trainers or classic Derbys. Black tie too formal? Shirt without a tie not working for you? Maybe you’re just not a fan of going the full hog with your formality. Enter, the black T-shirt. Deserting the shirt for a smart tee has been a saving grace for many when needing to pull together a sharp look, especially for an event with an ambiguous dress code. In more laid-back takes on formalwear, a printed shirt would work well to lighten the mood. But when it’s all about looking suave without the clutter, a basic black tee is your go-to. Stick to muted monochrome for sure-fire success here: under a black jacket, this look is classic and modish at once. If you want to mix things up, let the black top break up a grey or white blazer from matching bottoms. So far, we’ve shown the benefits of keeping things simple, in design and curation. But if you want your outfit to make a bit more of a statement, then channel the style of rock ‘n’ roll legends gone by (and their fans) by throwing a graphic tee centre stage. Don’t shy from a bold print on your tee or simply opt for a band tee to hit the trend on the nose. Under a jacket or oversized shirt, it’ll add character and break up the monochrome tones. Ripped jeans – or at least a skinnier fit – are essential to nailing the aesthetic and will give your whole look a shape that accentuates the bold tee. In the last year or two, Arket has become a staple brand for any dresser keen on curating a minimal wardrobe. Their T-shirts are true-fitting and come in a range of weighting and fits, allowing you to opt for different styles to cater for your needs. The brand develops its fabric to retain colour and shape for longer over time too, which is a win for your pocket and for the environment. In the nineties, a CK-branded T-shirt was almost as much of a style statement as CK-branded boxers. And now, with all things nineties trending hard, it’s the perfect time to revisit this affordable slice of designer gear. You can choose how big you want to go with the logo, but what’s even more memorable is the softness of the brand’s jersey. Bershka offers plenty of range, giving you simple cuts in various necks and both minimalist and graphic pieces. All at a price that won’t break that bank. Investing in a couple of different designs will work across various dress codes. If you’re after a little bit more of a statement brand-wise, don’t get suckered into the droves of designers and choose Comme Des Garçons Play instead. Breaking the bank does offer a return of quality assurance and the brand’s iconic heart-shaped logo has become a symbol of style nous whatever outfit it’s placed in. The Japanese fast fashion giant is slowly but surely taking over the world with its range of endlessly wearable basics and commitment to good materials at bafflingly good prices. 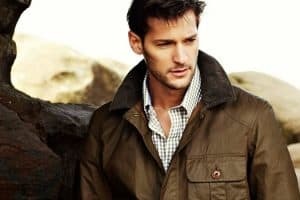 Its T-shirts come in various necklines, in soft supima cotton or a number of technical fabrics designed to keep you warm, dry and comfortable whatever the conditions. Carhartt is known for its quality in outerwear and workwear, and when it comes to the basics like a black T-shirt, the brand doesn’t slack. Quality-wise, you can expect a slightly heavier weight to the fabric, which will help it last longer. It’s also a brand that does the logo trend better than most. One of the few clothing brands for which environmentalism is an ethos not a marketing gimmick, Patagonia is a go-to for any sustainably-minded shoppers. Case in point: its aptly named Responsibili-Tee. Made from roughly 4.8 recycled plastic bottles and fabric scrap, the brand claims it saves 63 gallons of water compared to a conventional cotton tee. They look good, too. Not all your basics have to be, y’know, basic. Hugo Boss shows what a designer touch can add, with some of the best-fitting tees to be had. Again, there are a number of styles and necklines to choose from and multipacks make the Boss options just as affordable as some of the others on this list. Sunspel makes black T-shirts for Daniel Craig as 007, which might be all you need to know about the quality up for grabs here. Made in England with some of the finest cotton available, the brand also does performance fabrics that wick moisture away from your skin to keep you feeling as fresh as you undoubtedly look. Restocking your basics at this Scandinavian behemoth is almost too easy and too affordable not to. Not that it’s all about convenience. H&M tees fit well, feel good and the retailer also encourages customers to recycle their unwanted garments in-store.